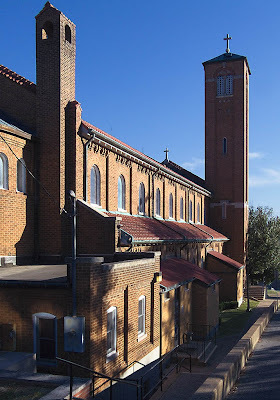 HERE ARE PHOTOS of Sacred Heart Church, in Crystal City, Missouri. 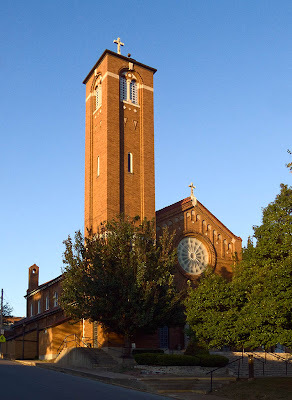 The city is located in eastern Jefferson County, on the banks of the Mississippi River, about 36 highway miles south of downtown Saint Louis. The parish dates from 1881. What is now Jefferson County was sparsely settled in colonial times, being more the home of the wild men and beasts of the forest. The earliest towns tended to be located on the Mississippi or Meramec Rivers, for convenience of transportation. Crystal City is named for glass crystal which used to be manufactured here. In town are outcroppings of Saint Peter's Sandstone, an exceptionally pure, white sand used for making clear glass. ...The first settler in the area was Charley Conners, who built a log cabin here in 1803. Around 1843 an Eastern company conducted a search in this area of Missouri, looking for land with valuable minerals. In 1868 Forrest Sheppards, a mineralogist and geologist, located silica (sand rock) near the mouth of Plattin Creek. The sand was of superior quality for glass manufacturing. What followed was an enthusiastic pursuit of development, and The American Plate Glass Company was founded here by Captain Ebenezer B. Ward of Detroit, in 1871. In 1876 the Crystal Plate Glass Company built four gas-fired furnaces and produced plate glass. The glass was made on large square tables, ground with sand, smoothed with emery and polished with rouge. Before glass was actually produced, brush was cleared and homes were built for the workers and their families moving to this new town, originally called New Detroit. As the town grew, the residents sought their own identity, and the name of the town was changed to Crystal City. American Plate Glass Company was sold in 1877 to the Crystal Plate Glass Company of St. Louis, and in 1895 the factory; town and all its holdings were acquired by Pittsburgh Plate Glass Company, which later became PPG Industries. Purchased in 1895 by Pittsburgh Plate Glass Company who in 1908 built a new factory powered by steam generated, direct current electricity. Crystal City Works Nine became the largest plate glass plant in the world. By 1899 the area’s population was estimated at 1,200. Crystal City remained a company town until 1906, when PPG began selling lots to private citizens, thus promoting Crystal City’s growth. Around 1903, just before the St. Louis World’s Fair opened, the St. Louis, Memphis and Southern Railroad purchased the company-owned railroad’s right-of-way through Crystal and Festus to establish what became the Frisco Line. It is now the Burlington Northern. In 1925 Union Electric brought a power line down the east side of the Mississippi River from Cahokia. It crossed the river to a tower on Buck Knob to supply the new factory. Between 1925 and 1930 PPG constructed a continuous flow tank and 1,100-foot ribbon grinder and polisher. By 1964, PPG had established a separate division for auto glass and all production was being done a Greensburg and other plants. During World War II PPG set up the Bomber Department and produced canopy subassemblies for the Curtis Wright Company. Work done by the Duplate Department led to the formation of an Aircraft Glass Division within PPG. In 1965 PPG obtained a license from an English firm to use their prints to build a Float Tank and Tin Bath. The new float glass replaced the production of plate glass. The last plate glass was made in Crystal City in 1972. In 1985 first word of Work Nine closing was announced, but it was operated until December of 1990. In May the glass factory at Crystal City turned over to the salvage company. June the first, the doors of the main office were locked. Glass was shipped until December. The Monday after Christmas 1991, Union Electric shut off the power and the last life drained from Crystal City Works Nine. Today, nothing of the glass factory remains, other than the company headquarters building and the hospital. Both are now used for other purposes. As the new town developed, residents wished to have a more dignified name for their city when it was platted. Legend says that Elizabeth Posch, local business owner, opened her Bible and declared that the first proper name that she would come upon would be Tanglefoot’s new name. The name was Festus for Acts 25:1. There still is glass manufacturing in the area. Saint-Gobain has a factory in Pevely, five miles north of Crystal City. 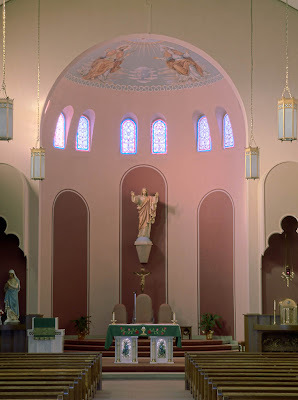 The church has a traditional basilica plan, with three aisles, symbolizing the Trinity, and a semi-circular apse designed for better acoustics: many ancient churches and synagogues were of this design. 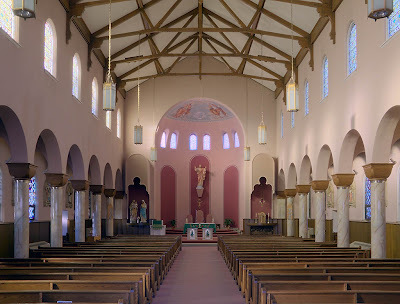 The lower windows here are darker with Christian symbolism, while the clerestory windows above are lighter in color and are more abstract. The church is painted with rose colors. 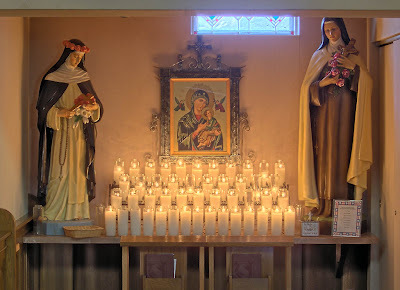 As a mixture of the color of red, symbolizing blood, and white, symbolizing purity, rose is an appropriate color for the Sacred Heart, and is made explicit in the red and white rays of light emanating from the Heart of Jesus in the Divine Mercy. 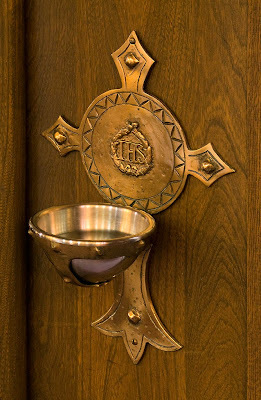 Rose is also a joyful color, used as liturgical colors twice a year during the penitential seasons. 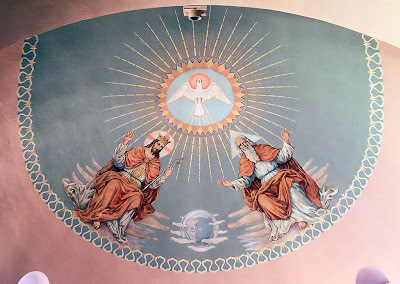 Symbolic representation of the Trinity at the top of the apse. 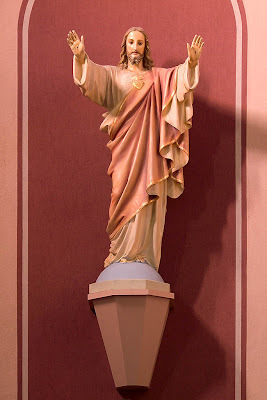 Statue of the Sacred Heart of Jesus. 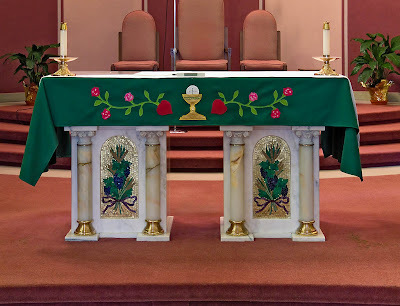 The green altar cloth shows rose vines growing from hearts, nicely continuing the theme of the color rose and the Sacred Heart. Wheat and grapes are represented in the mosaics on the altar. 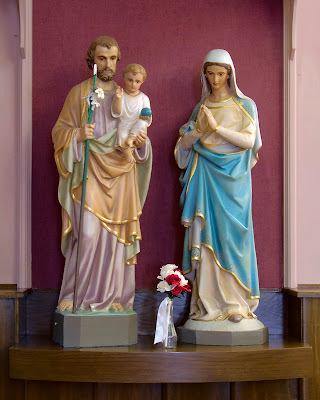 The Holy Family to the left of the altar. 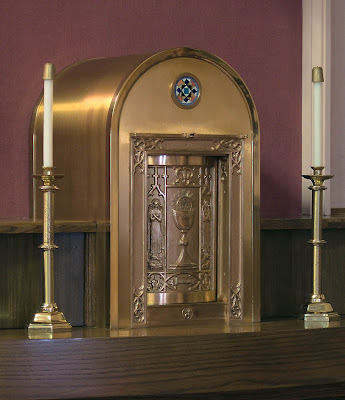 The tabernacle to the right of the altar. It is located above a carved wood representation of the Last Supper. 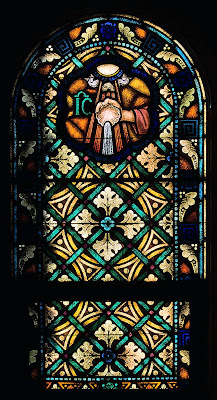 Stained glass window with a symbol of baptism. 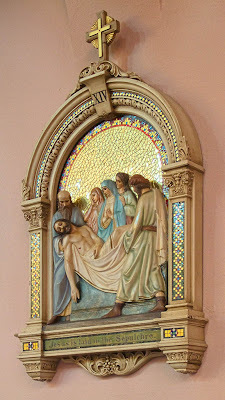 XIVth Station of the Cross: Jesus is laid in the Sepulchre. Our Mother of Perpetual Help icon, flanked by Saints holding roses, in a niche on right side of nave. 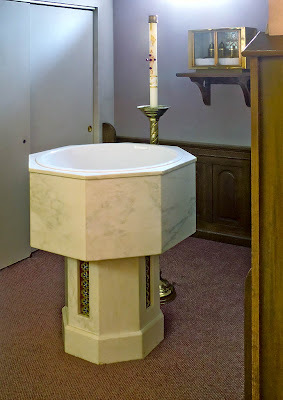 Baptismal font, holy oils, and Paschal Candle, located in a niche on the left side of the nave. 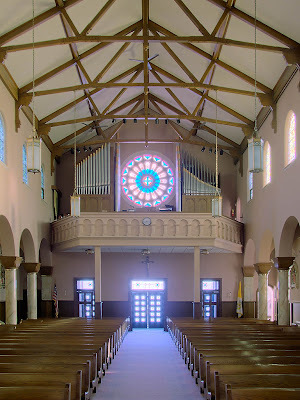 A view to the back of the nave, showing the organ pipes and rose window. 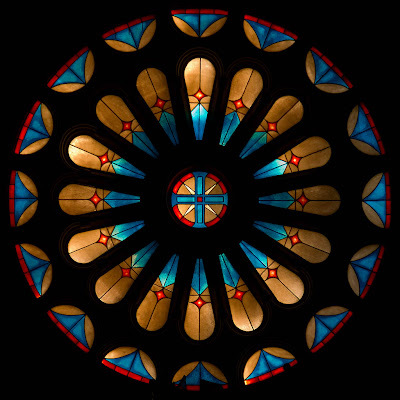 A somewhat more accurate photo of the rose window.